“The history of the art and design education from 1990 to the current cannot be complete without linking it to his [George Kyeyune’s] art practice and teaching.” This is what Dr. Kizito Maria Kasule, Dean of the Margaret Trowell School of Industrial and Fine Art, wrote about Prof. George Kyeyune in the catalogue that accompanied his exhibition, “Quiet Dignity” that opened at Makerere Art Gallery on August 6, 2015. Thousands of graduates have passed through Kyeyune’s hands and his contribution to art academia in Uganda, especially through his 2003 PhD dissertation, cannot be overlooked. For nearly as long as Prof. Kyeyune has been teaching, he has been creating art, primarily in the media of painting and sculpture. The landscape of Uganda is literally marked with his legacy in the form of public sculptures, such as The Stride monument. The presentation of his work with modelling wax was successful. He exhibited the materials he was experimenting with to create the wax. These include sap from a muwafu tree, paraffin wax (imported but available and cheap), and beeswax. However, he is still experimenting with exact ratios and the effects of mixing in petroleum jelly and other materials. Alongside his findings he presented the sculptures he tested out with his new method. Bust of a man, Nabulime, and Love letter reflected his broad-stroke style of painting, favouring wax strips layered together rather than a smooth mold. 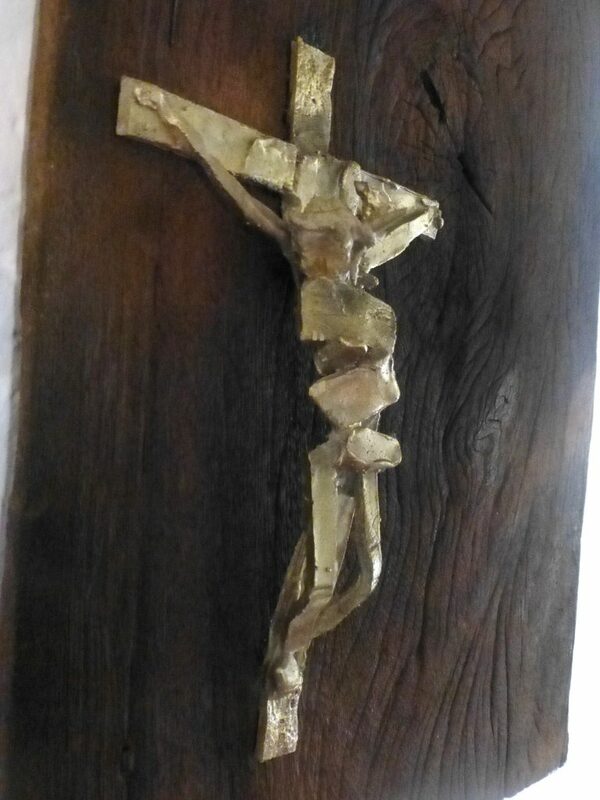 His favourite, however, was Jesus on the Cross, which he liked for its geometric style, with rectangles, triangles, and other angular bits of brass fitted together. It was mounted on dark, grainy wood with deep grooves, which, as a frame, helped evoke a mood from the otherwise simple brass sculptures. Jesus Christ on the Cross (2015). Molded out of bits of brass fitted together and with geometric styles. Image by Martha Kazungu. However, the presentation of his paintings deserves deeper scrutiny before deciding whether or not it was truly successful. The work Kyeyune presented in this exhibition included a series on the theme of kwanjula, the ceremony in which a woman introduces her intended marriage partner to her family. It also included a series on social life which mainly featured women in the lower class doing everyday things which seem mundane on the surface but speak of deeper issues. For example, the Kasooli Vendor is a painting of woman selling maize. She is isolated in the image and while the subject matter seems ordinary, it says much about the economic inequality in Uganda; the lack of action by government, and the fact that the system repeatedly places women at the very bottom and therefore in the worst situation. Kyeyune’s portrayal of the role or position of women in society is commendable and while Dr. Angelo Kakande attempts to discuss the topic in the exhibition catalogue, considering that neither he nor Dr. Kyeyune are women, there remains more to be said. Still, Kyeyune’s intentions are benign. However, these themes are not new to Kyeyune’s work, neither is the subject matter. 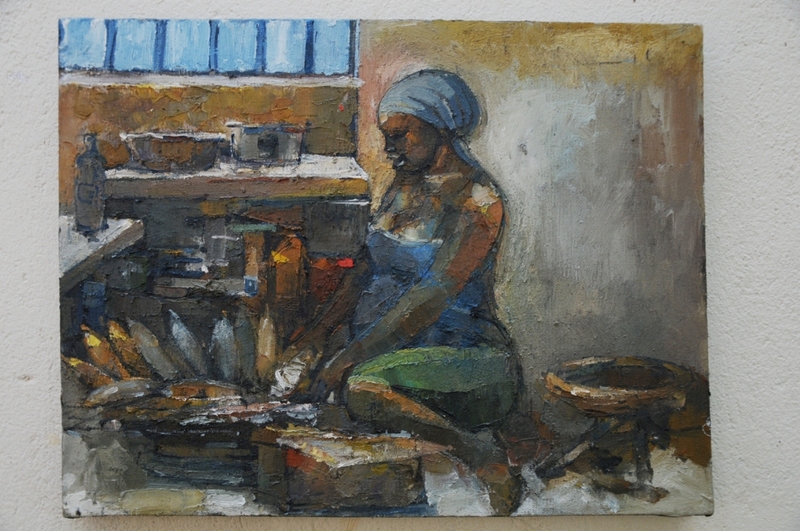 His 2011 exhibition, “The Kampala I Will Always Come Back To”, featured a painting titled At the Salon (2011), which shows a woman squatting while getting her hair done and her nails manicured. This painting is similar to Buying Beauty II (2015) which also features a squatting woman getting a manicure. It also featured a painting titled Roadside Vendor (2011) which, like Kasooli Vendor (2015) features a woman selling maize. The difference is that in the 2011 painting the woman has her back turned but the viewer can see the naked baby she is holding, so the social criticism is easier to pinpoint. 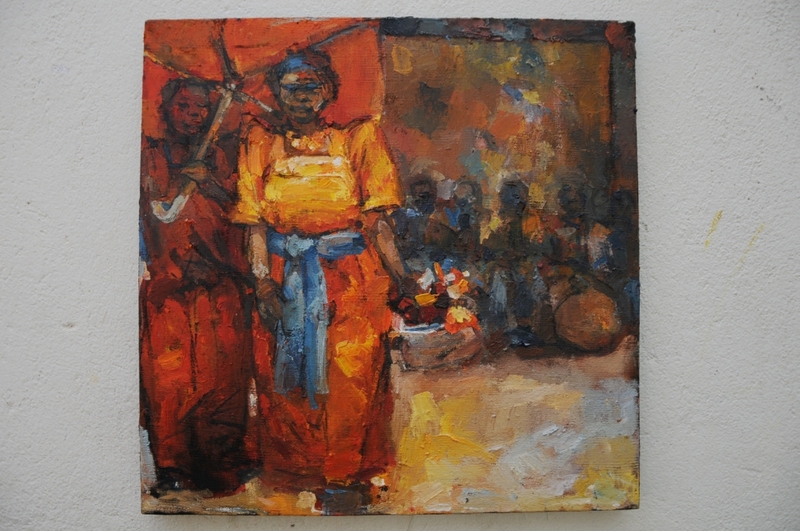 This exhibition also featured works such as Boda-boda I (2011) which is related to 2015 boda-boda themed paintings such as Boarding and Tutwaleko. Kasooli Vendor (2015). The painting explores and discusses the theme of economic inequality in Uganda that pushes women at the bottom. Image by Martha Kazungu. What can be said for the artist whose subject matter doesn’t change? Is it that they have failed to grow? Well, it depends on whether you look at the subject or the material. “Maybe social subjects like the Kalerwe market present me an opportunity to make art, not necessarily the opportunity to make a painting which is social but a painting that in which questions of colour and light and dark and shadow are resolved. So in some cases it’s about resolving something else but using those social subjects as a context to resolve an artistic challenge,” said Kyeyune in response to a question about his subject matter. He was not oblivious to the repetitive nature of his subject matter but rather emphasized that his exploration in painting was with colour, light, dark, and shadow. The social subjects he painted about were prompted from his experiences (as the father figure at a kwanjula) and from what he observed everyday moving about Kampala. The social issues stir his conscience. Still, the subjects were just the occasion, the reason to paint and not necessarily Kyeyune’s goal. 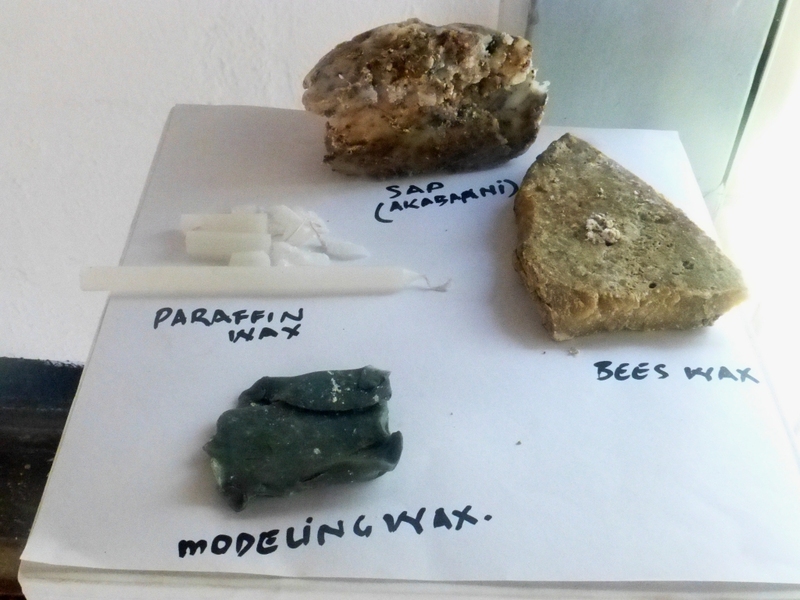 Samples of modelling wax from local inexpensive materials on display. The art is pushing the boundaries of his art with these materials. Image by Martha Kazungu. 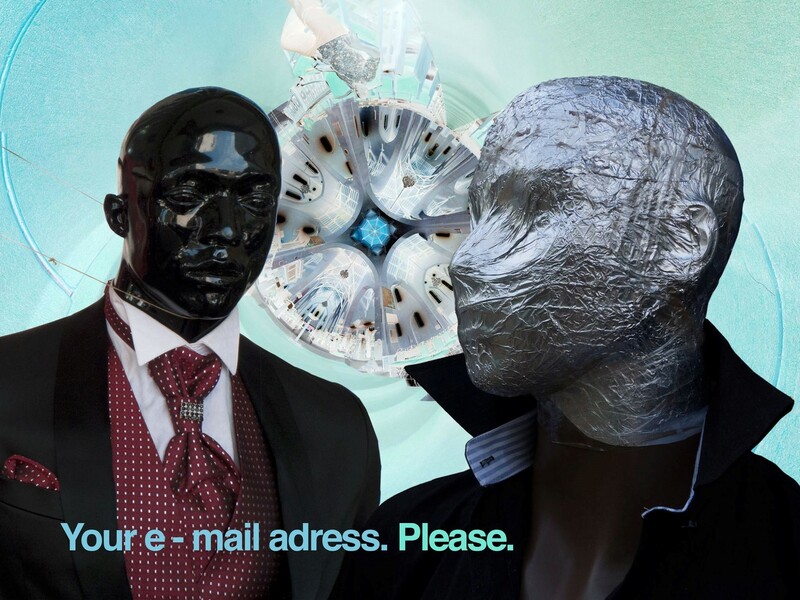 Then again, there is little difference between the extreme of conceptual artwork and the extreme of technical perfection. After a while, only a few experts can confidently identify how well the artist has mastered the work, whittling the audience down to an exclusive few. Kyeyune’s achievement in technical mastery is lost on any audience that is not conversant with the subtleties of light and colour. In the end it becomes a question of the criteria the art community is using to decide what makes an artist authentic. It also becomes a question of how the art community values an artist’s contributions (studio or academic) and whether those contributions will maintain the same weight over the years.